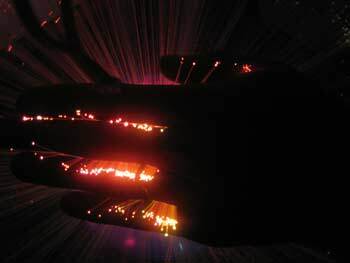 I've been interested in fiber optics for a long time. I think I was about 7 years old when I saw a flashy fountain of color on the shelf at the Yee family home. It was a tech-curiosity. 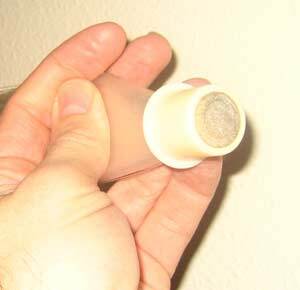 It looked like the kind of thing that you would find at Sharper Image if they had existed back then. 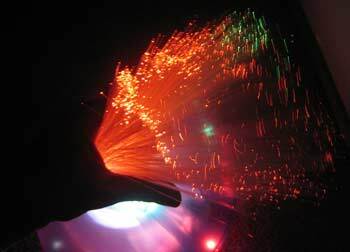 The hundreds of fibers contained the light, allowing it to travel along to the end, where a tiny dot of bright color was visible. The colors shifted from red to yellow to blue. It was mesmerizing. 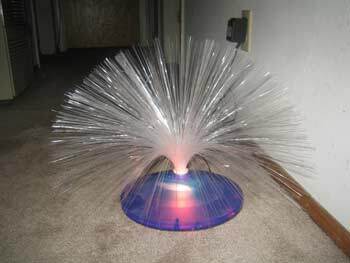 In the last 10 years, fiber optic decor has blossomed. It is used particularly to spice up Christmas. I've seen fiberoptics integrated into trees, wreaths and in tiny Christmas dioramas. There was an entire shelf of that stuff at Target last winter. I wanted to try my hand. 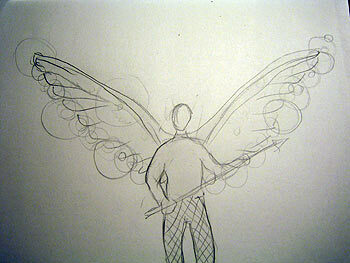 While brainstorming for new Halloween costumes, I had an idea to incorporate fiberoptic lights into a big pair of angel wings. I imagined thousands of light strands terminating along the wings edge, appearing as thousands of sparkly, pinpoints of light. 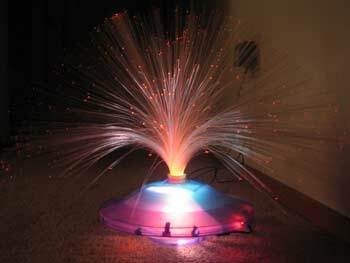 I know that fiberoptic patch cables are expensive, but the fact that fiberoptic toys are being sold for $9 at Target meant that there had to be a source for super-cheap fiber. Or maybe there was just a trick. In December, when Anna came up from L.A. to visit Eric and Amanda, I got a chance to study one of those fiber optic toys a little closer. 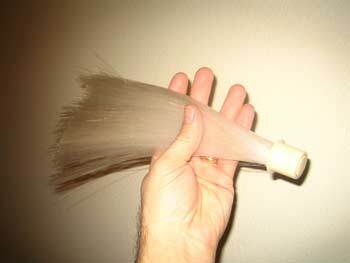 The fibers looked like monofilament fishing line. They were loose on one end, but were held together on the other with a little collar. All of the fibers terminated here, and this spot was in close contact with the light source. It was simple. It looked simple. Anyway, as you've probably guessed by the title of this webpage, I decided to try my luck at handcrafting fiberoptic cables from fishing line. 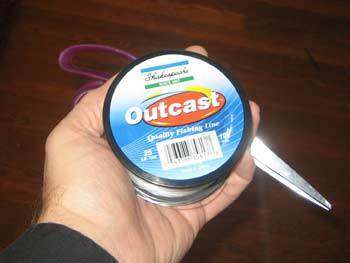 Out on a daddy/daughter shopping trip, I picked up this little reel of monofilament fishing line for $4. Broadway Bait and Tackle is not a safe place for infants. There are fishhook bins, racks of machetes, lead weights, skinning knives and cheese-flavored nightcrawlers. I had to hold June above my head the entire time I was in there, and she still managed to get poked by a 16-point whitetail mule deer that was mounted over the doorway. Please continue reading page 2 of Fishing Line Fiberoptics.